Because I prefer my music on a smaller scale—jazz trios, chamber music recitals (exceptions: Jazz at Lincoln Center Orchestra, Maria Schneider Orchestra, Dave Holland Big Band)—I mostly ignore the Minnesota Orchestra. Although I know the occasional Beethoven symphony would do me good, and everyone says Osmo Vänskä is an amazing conductor, it's not on my radar. And since the sound at Orchestra Hall is hit-or-miss for almost anything but the orchestra, I rarely go to the big box with the giant sugar-cube ceiling. But lately interesting things are happening there. Jazz is heard more frequently, with more to come; starting in April, there's a mini-series called "Jazz at Orchestra Hall" and it's not Doc Severinsen. Another small series, "Sounds of Cinema," began last week with a screening of Charlie Chaplin's City Lights, with Vänskä and the orchestra performing Chaplin's original score. I didn't go but a friend did and she loved it. 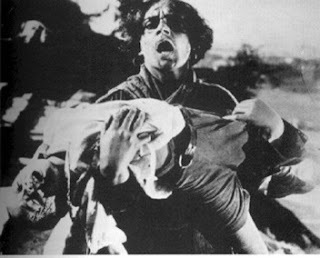 "Sounds of Cinema" continued tonight with Sergei Eisenstein's The Battleship Potemkin (1925) and a score compiled from portions of Shostakovich's symphonies. The movie was projected onto a large screen at the back of the stage, the orchestra filled the stage (I forget how large orchestras are), and we were in the second row, where we couldn't read the subtitles without craning a bit but we could see every move the bass players made. Conductor Esa Heikkilä is a protégé of Vänskä; this was his first appearance here. I had never seen the film Roger Ebert calls "one of the fundamental landmarks of cinema" (my bad) but I recognized iconic scenes, like the baby carriage careering down the Odessa steps. The music—parts of Shostakovich's Symphonies Nos. 4, 5, 8, 10, and 11, pieced together by Soviet musicologists in 1976—fit the film like 10-year-old Anastasia's white opera gloves. The performance was 90 minutes without an intermission, and the time raced by. It was entirely thrilling. It made me want to catch up on classic films (does that mean I have to stop watching Project Runway?) and buy season tickets to the orchestra. The third and final "Sounds of Cinema" performance is called "To Boldly Go....," and it's hosted by George Takei, Star Trek's Dr. Sulu. Music from Star Wars, Close Encounters, Star Trek, and Holst's The Planets. That one I'll skip. The selection of Shostkovich works normally put to 'Potemkin' was actually assembled in 1955-56 as a new soundtrack for a revised print of the film issued to commemorate the fiftieth anniversary of the 1905 Revolution. I have a theory (thus far, untested) that Shostkovich was actually asked to write new music for the film and got as far as music for the Odessa Steps sequence before abandoning it, running out of time or finding something better to do. The fit of the music from the 11th Symphony (which he actually programmatically linked to the 1905 Revolution) to the Odessa Steps scenes is so obvious; I'd spotted it before I even came across the 1955-56 print of the film!